Bloom Time Mid spring to summer (April - June). Foliage Type: Bushy clumps of vibrant golden yellow to green leaves. Foliage provides a slight tinge of purple when it emerges in spring. Bloom Time: Mid spring to summer (April - June). 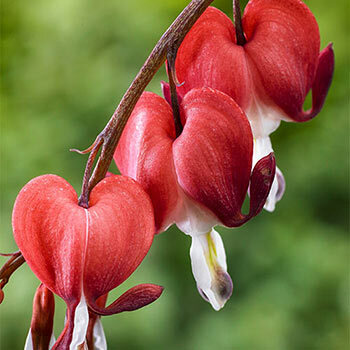 Flower Form: Large, heart-shaped, pendant flowers on arching stems. Planting Instructions: Plant eyes slightly below soil level and space 20-36'' apart. Add plenty of compost, humus, or peat moss at time of planting to aid in water retention. Soil Requirements: Well drained, moist soil. Soil should be fertile and humus-rich. Pruning: Remove faded flowers regularly will promote lots of new buds to form. Cut stems back to 1''-2'' after first killing frost. Winter Care: Mulch +/- 5 cm the first winter and remove before grow start. Additional Information: Avoid heavy clay soils. Protect from high winds and early frosts.